Animals From History is a personal project created by illustrator, Christina Hess. AfH explores animals as historical personalities in portrait form paired with quick tag lines offering insight into each character. A lover of animals and art, Christina continues to add to this collection every year. Some animals are imagined by the artist while others are actual living or departed pets of clients. The stories section of this website shows a few stories focused on one character at a time. Some entries are pulled directly from actual historical documents, such as Napoleon's love letter to Josephine. This section of the site is a work in progress and will slowly grow over time. Animals From History has been featured on Jezebel, ABC News, Juxtapose, Mental Floss, Modern Met, Catster and many other blogs and publications. You can visit this site's shop for prints or seasonal publications such as calendars and booklets. For a different selection of print sizes and merchandise visit Christina's Society 6 store, https://society6.com/christinahess. All international orders can be made through Christina's Etsy store, https://www.etsy.com/shop/ChristinaHessArt. It all began in 2009. A family friend requested Christina create a portrait of his white cat, Lady, as Queen Elhissabeth I. At first she was hesitant. Ironically, she did not want to be "that" person who painted animals in clothes. But alas, it became an extremly fun and satisfying project. Many pet owners and animal lovers rejoiced. Soon after the release of Queen Elhissabeth the little cairn terrier, Bruno, as William Pawllace followed. 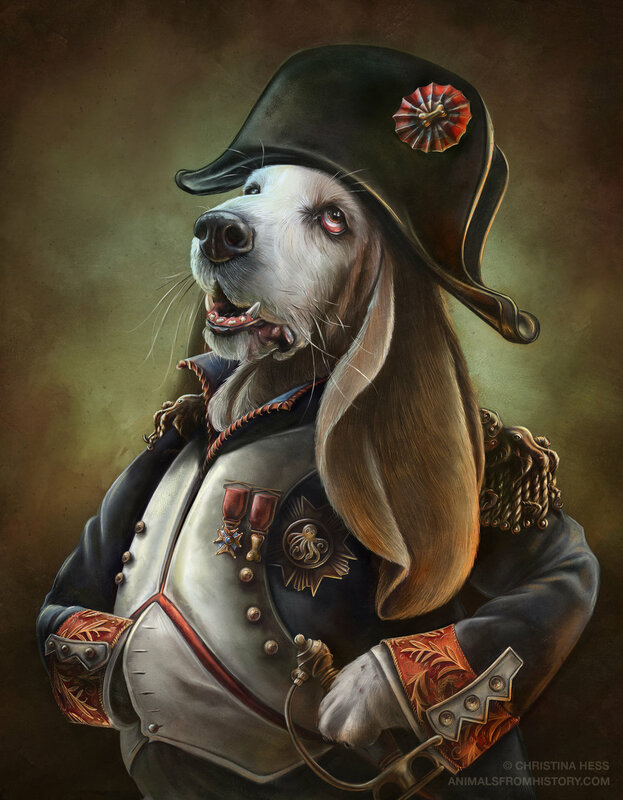 Then the artist's basset hound, Roscoe, as the appropriately depicted Napoleon BonEaparte.